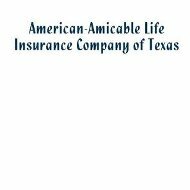 American-Amicable Life Insurance Company of Texas is, as the name suggests, a life insurance company; however, they do not sell health insurance products of any kind. American-Amicable was founded in 1910 under the name Amicable Life. It was their acquisition of other companies and combining names that created the name that they have today. Enter your zip code below to compare health insurance quotes from multiple companies. American Amicable is a financially stable company with an AM Best rating of A-, which is an excellent rating. In addition, the company’s outlook is stable, which means that they are expected to be able to continue to meet their financial obligations and pay their claims. The company itself has about $6.7B life insurance policies in force today. Despite the clear growth and success the company has achieved over the years, their website is dismal. It is difficult to find what it is you are looking for and the site is built without the user in mind. According to American-Amicable, some of these products are only available through their affiliates, however, they do not list who those affiliates are. American-Amicable products are only for sale via independent agents. The problem you will face if you are considering this company for your life insurance products is that they do not provide an agent-finding tool to help you find an agent in your area. Although they do not say where their products are sold on their website, it appears as if they are licensed in all 50 states. It is difficult to say for sure, as they do not have a list that we could find; however, we did find a list of forms for medical examiners by state that suggests that they sell products in those states. It is not clear how easy or difficult it will be to make a claim with American-Amicable. Their financial rating suggests that they are paying their claims when they come due, otherwise they would have a lower rating; however, there are no claims forms online. In order to file a claim, you have two choices. Either you can email [email protected] or you can fax your claim to 254-297-2756. There is no information about what you will have to provide at the time of your claim, but certain assumptions can be made because this is a life insurance policy. If the death is suspicious, the company may require that an adjustor review the claim to ensure that everything is in place. In order to reach customer service at American-Amicable, you have the option of a local number, for those of you in Waco, or a toll free number for everyone else. You will find that this is a company that likes to keep tight hours as they are open Monday through Friday 8 AM to 4:45 PM central standard time. American-Amicable does not have a 24-hour claims or customer service center. Part of the reason for this is that this is not a company that deals with emergencies. Life insurance claims do not have to be reported within a certain amount of time to be valid. As a matter of fact, you can make a claim several years after the death of the policyholder, as long as you have the policy number or the actual policy in hand. As you may have guessed when we mentioned how limited the American-Amicable website is, there is no way for you to get a quote for a potential policy online. There is no clear indication on the website as to whether you can call the company directly for a quote or if you need to contact an outside agent. Of course, unless you know of any agents that sell their products, you will have to call the company to get that information. Regardless, American-Amicable does not sell health insurance products. If you are looking for free health insurance quotes, then you need to enter your zip code below right now!